The painter Harold Joe Waldrum was born in Texas and came to New Mexico with an already-keen eye for the southwestern landscape. The color, texture, and character he found in Taos, however, exceeded his wildest imagination and the region became his lifelong muse. Waldrum’s journey to becoming a well-respected and established artist was fueled by his diverse artistic background, having pursued a musical proclivity, painting, photography, and even video. His unique and intelligent approach of transforming the visible world onto canvas earned him a coveted spot in many prominent collections and galleries. After years of family life and teaching music, Waldrum earned his Masters in Painting. 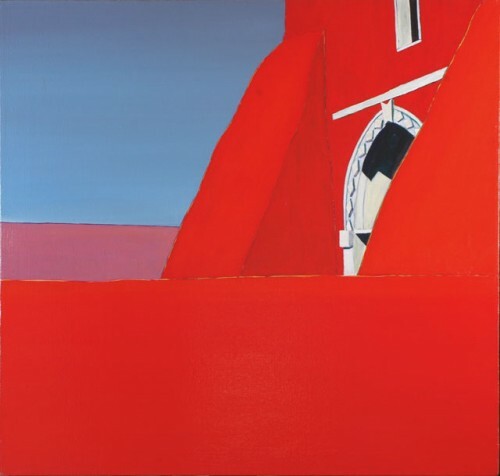 He became well known around 1980 for his “Window Series,” a series of value and color studies inspired by the adobe buildings in the Southwest. Waldrum felt the pulse of the landscape, architecture, and people around him. He observed, “There is a beautiful place in the United States of America. It is in northern New Mexico between the two mountain ranges. This place is called The Cradle. Its people, the land, and its elements are special and peculiar. 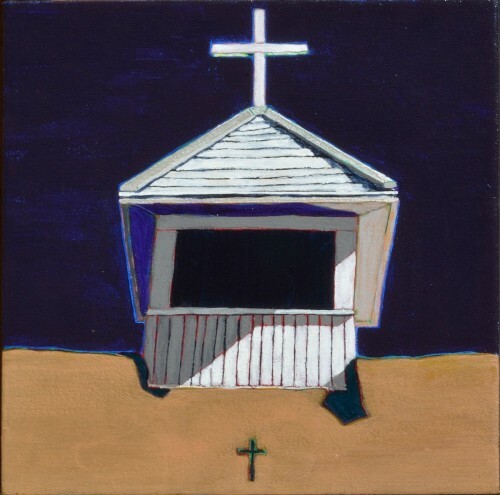 I find the genius of this place reflected in the churches.” Waldrum’s eye for the distinct lines, color, and negative space of churches, when translated to the canvas, brought him acclaim. Awareness of the beauty of the everyday and a deep spiritual connection to his surroundings filled the mysterious world of Harold Waldrum. He saw the adobe churches in the Southwest as, “a heart of a culture” and used his unique style to express his affection. Clean lines, bold shadows, and rich pigments became the defining features of a Waldrum painting. He also showed a deep interest in negative space, “I’m very aware of the negative. I thought the negative shapes represented the subliminal thoughts.” Waldrum’s remarkable use of negative space is very apparent in his Adobe paintings. 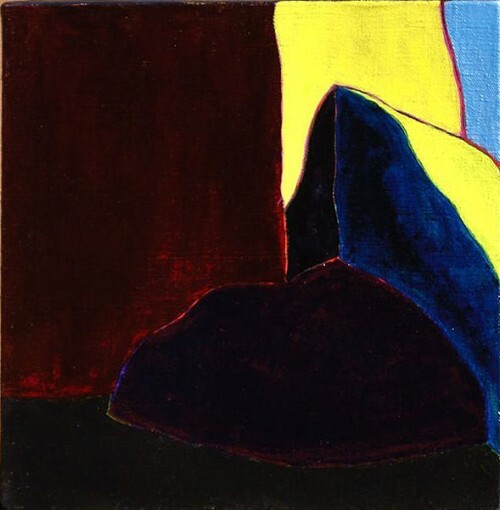 Waldrum’s deeply thoughtful and almost atmospheric paintings have rightfully held their status in Southwestern and contemporary art since his passing in 2003. When talking about Waldrum’s artwork, Southwestern Magazine stated, “When a work endures over time it’s because it has touched something elemental in the common experience of people. It expresses something universal about life.” His paintings not only please viewers from a rich aesthetic standpoint, but reach much deeper, expressing a love and understanding for Southwestern culture.